When I was maybe nine or ten, my Aunt Joan taught me how to sew. We made a colorful robe with bumble bees and flowers on it, which I gave as a gift to my mother for her birthday. My mother may have stopped wearing that robe years ago, but she kept it and recently, when I was at her house, I looked it over and saw that it was pretty well made. That wasn’t me patting myself on the back. Joan took me through each step of making the robe but I’m pretty sure she did most of the actual work. She probably tried to get me to do it, but I was more excited about the idea of the project (and the fabric) than about the actual work involved. To this day, I do not know how to use a sewing machine. I can hand stitch fairly well and can sew a button on a coat, but I wouldn’t trust myself with a hem or any visible stitching. 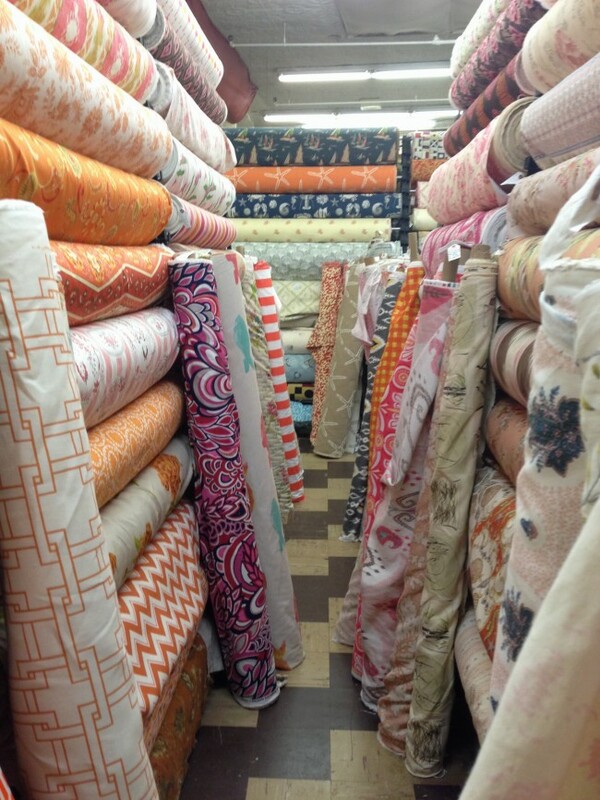 Yet, when I walk into Zimmans, the most amazing fabric store in the world, which is only a few miles from my house, my heart races and I need to make my way up and down every aisle, inspecting each bolt of fabric with my eyes and my hands. I imagine all the wondrous things I could make with this or that fabric, and notice particular nooks where I would enjoy cuddling up with a book and possibly getting locked in the store overnight. Something about the huge, high ceilinged room crammed full of fabric bolts, some hung in rows, some standing upright in barrels, some leaning against the walls, in every color, texture and pattern imaginable gives me the same thrill as those kids felt when they first entered Willie Wonka’s chocolate factory. Today, I spent a couple of hours in Zimmans, even though I had a pretty good idea of what I was going to buy before I entered the store. At one point, a salesperson found me and asked if I needed help. I told him I was still in the looking stage and it would probably take me awhile, but I’d find him when I was ready. He laughed and said the looking stage can take a good long time. Daily, he must come across other people like me with our open mouths and glittering eyes and grabby hands. I guess he knows the best way to deal with my type. Let me wander. Let me take it all in. Let me take a few pictures. Let me run my hands along the rolls and rolls of fabrics until I have had enough. Then, I will probably buy. Like I did today. Nothing fancy. Just a couple yards of easy to clean, solid-colored microsuede for our long-in-need-of-new-covers kitchen stools. Everyone I know who sews also loves fabric shops. Sewing is a creative acitivity and fabric shops are where we buy our “art” supplies. I have gone out of my eay to find such places in any number of places I have visited and will have to check out Zimman’s when I am in your area again; it sounds promising. And I am glad to hear your momkept the robe for so long.